The following is available as a PDF. Click here to download. 1. The Iraq war killed millions — the politicians responsible are still walking free. 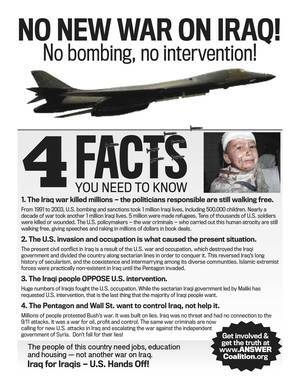 From 1991 to 2003, U.S. bombing and sanctions took 1 million Iraqi lives, including 500,000 children. Between 2003-2011 the U.S. war took another 1 million Iraqi lives. 5 million were made refugees. Tens of thousands of U.S. soldiers were killed or wounded. The U.S. policymakers—the war criminals—who carried out this human atrocity are still walking free, giving speeches and raking in millions of dollars in book deals. 2. The U.S. invasion and occupation is what caused the present situation. 3. The Iraqi people OPPOSE U.S. intervention. Huge numbers of Iraqis fought the U.S. occupation. While the sectarian Iraqi government led by Maliki has requested U.S. intervention, that is the last thing that the majority of Iraqi people want. 4. The Pentagon and Wall St. want to control Iraq, not help it. Millions of people protested Bush’s war. It was built on lies. Iraq was no threat and had no connection to the 9/11 attacks. It was a war for oil, profit and control. The same war criminals are now calling for new U.S. attacks in Iraq and escalating the war against the independent government of Syria. Don’t fall for their lies!